Groundwater inflows into tunnels may constitute a potential hazard as well as an important factor controlling the rate of advancement in the excavation. In fact, one of the major practical difficulty during tunnel construction is often associated with the presence of groundwater. Predictions of groundwater inflows are also needed to design suitable drainage systems. Furthermore, drawdowns produced by tunnel construction may induce land subsidence, water table decline and environmental impacts on rivers and wetlands. In the literature, there are several analytical expressions to calculate water discharges into tunnels but a major development was presented recently by Perrochet and Dematteis (2007). The program TunFlow makes use of the above-mentioned analytical expression to compute groundwater infiltration into tunnels and galleries. The program allows an unlimited number of geological zones (heterogeneous system) to be accounted for. Furthermore, fully transient hydrogeological conditions (accounting for the velocity of tunnel advancement) are considered. TunFlow is easy to use and is especially suited for the evaluation of groundwater filtrations in scoping studies for tunnels construction. Before running the model, it is preferable to create an Excel sheet with all the information requested by the code. The numbers of layers is specified in the Graphical User Interface (GUI) of TunFlow (1 and 2, figure 1).The number of time steps must be also selected (3, Figure1) . By default, 1000 time steps are used. It is worthwhile noting that increasing the number of time steps improves the accuracy of the solution but also increases the computational costs of the simulations (i.e. simulation time). Figure 1. Screenshot of the Graphical User Interface (GUI) of Tun Flow. Once all the parameters are imported in TunFlow, the program can be executed (4, Figure 1). Tunflow provides diferent outputs. Calculated data can be exported in txt and xlsx file formats (1 and 2, Figure 2).On the other hand, the program also plots the results as the tunnel inflows Q (l/s) versus time (d) (3, Figure 2). Figure 2. Results and output options of TunFlow. The input parameters can be also exported as an xlsx file (1 and 2 in Figure 3) and used for new simulation runs. Figure 3. 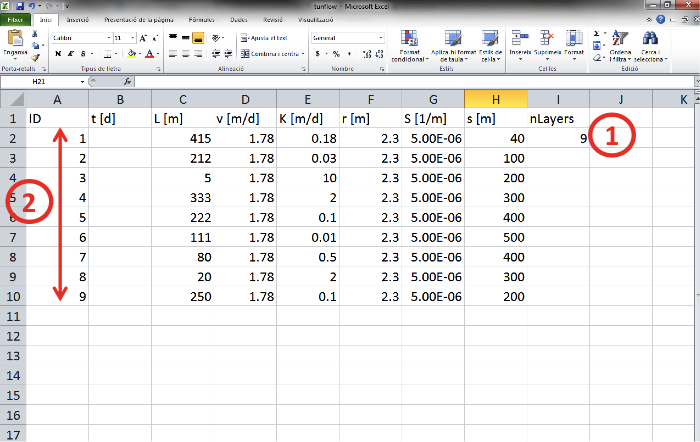 Preparation of the input parameters in an Excel spreadsheet. Figure 4. Import of the previously created Excel file into Tun Flow. Jordi Font is a geologist and mining engineering diplomate, he holds a PhD in Geosciences from the Technical University of Catalonia (Spain). Jordi’s areas of expertise include development of hydrogeological conceptual models, tunnel inflow quantification with analytical formulae, and groundwater tunnel modeling. Jordi has several publications in peer reviewed journal and congress proceedings. . He is currently senior consultant at Amphos21 where he deals with different projects related to subsurface flow modelling and hydrogeology of mines. Perrochet, P., Dematteis, A., 2007. Modeling Transient Discharge into a Tunnel Drilled in a Heterogeneous Formation. Ground Water 45 (6), 786–790. This work has been conducted at Amphos 21 in collaboration with Santos Jiménez, Paolo Trinchero and Jorge Molinero.